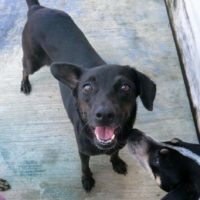 Nova, along with her three puppies was rescued from the jungle near Playa. She needed some medical work when she came to us, but she is 100% ready to move on to her very own family. She is a very sweet and gentle girl, and she LOVES kids! Nova takes a minute to process new things and new people, but once she decides you are hers, there is no better cuddler. She has zero interest in cats, all that potential curiosity is for kids. She wants a family!